In early 2001, I learned of a new book that was embargoed before release — not an atypical occurrence or something that portends significance; advance copies of books that may possess newsworthiness in the opinion of a publicist or publisher may include a non-disclosure promise that reviewers are asked to sign, or they don't get a book. But that doesn't mean that the book contains anything important; I had to sign a non-disclosure statement before receiving a copy of a relatively innocuous biography of mogul David Geffen. But with a title like "IBM and the Holocaust," I knew that something was up. I tracked down a copy, read it quickly and wrote the following review. 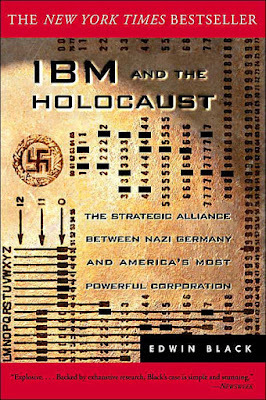 IBM and the Holocaust: The Strategic Alliance Between Nazi Germany and America's Most Powerful Corporation. Edwin Black. Crown. 528 pages. Edwin Black's book came out two weeks ago with no advance publicity. In fact, the book was virtually kept under wraps, with hardly any information offered to booksellers or the media. Nonetheless, as of this writing, it is a best-seller. The subject matter is explosive: the collaboration between International Business Machines and the government of Adolph Hitler. According to Black, the firm was not merely a passive order-filling vendor, but an eager and proactive partner who enabled and empowered the Nazi Reich with their technology. Specifically, IBM, (a company founded by a U.S. Census Bureau employee who invented a punch-card machine to automate the counting) devised, sold and supported a system for recording the German population's ethnic make-up. This allowed the extermination of Jews and other so-called non-Aryan religious and cultural groups deemed unacceptable by the Nazis. One of the biggest mysteries of the war, according to Black, was the uncanny prescience displayed by Germany in identifying and organizing its population and those of the nations it conquered. When he stood in front of an IBM card-sorting machine on display in Washington at the United States Holocaust Museum in 1993, Black, accompanied by his parents-themselves Polish Holocaust survivors-vowed to learn more about the role of this machine and its manufacturer. "What was the connection of this gleaming black, beige and silver machine, squatting silently in this dimly lit museum, to the millions of Jews and other Europeans who were murdered-and murdered not just in a chaotic split-second as a casualty of war, but in a grotesque and protracted twelve-year campaign of highly organized humiliation, dehumanization, and then ultimately extermination." The result is an exhaustively researched, highly detailed look at IBM, its history and business dealings. Thomas Watson, the company's undisputed MaximumLeader, is portrayed as a ruthless, amoral, avaricious operator. Just weeks before the Nazi's key election victory, Watson invested millions in fortifying his German operation, ready to assume an active, hands-on role in accommodating-and anticipating-der Furher's needs. The subsequent collection, organization and analysis of data, married to the Nazi's pseudo-scientific theories of eugenics and race, streamlined the process of mass murder on an unheard of scale. Furthermore, IBM technology, Black asserts, also enabled the German war machine's mighty manufacturing and distribution prowess. For these contributions, Watson received the Merit Cross of the German Eagle in 1937, a medal second only in prestige (per Black and his sources) to Hitler's Grand German Cross. Watson kept the award until a year before Pearl Harbor, well into the European war, and the persecution and extermination of millions. The question is raised how Watson and other IBM employees managed to get away with this murderous collaboration, how they escaped the notice of the press and the government. The answer, naturally, is complicated. Though much of the firm's activities at home and abroad were reported in newspapers (television news reporting was virtually nonexistent, and radio hardly a credible news medium) there was little effort made to "connect the dots'' — with one significant exception. In 1942, an investigation by a minor U.S. government bureaucrat did, indeed, make the necessary connections, but IBM, by then the world's biggest corporation, was also an integral part of the Allied war effort, and had been careful to create an unimpeachable image of patriotism. The investigation was abandoned. Black's book is, in many ways, like Spielberg's movie, Schindler's List; IBM and the Holocaust is an ugly story, hidden for years, told by a master craftsman in a compelling way. More than just another Holocaust tale, the author paints a remarkable portrait of how a powerful company created enormous opportunities, irrespective of moral concerns and consequences. It's a chilling lesson in politics and business that remains potent, relevant, and highly revelatory. Published February 26, 2001 in The Miami Herald.